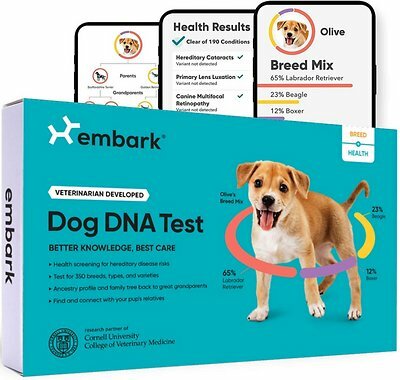 Get to know your pup like never before with the Embark Dog DNA Test Kit. This easy-to-use DNA test tells you more than you ever thought possible about your dog, like a complete breakdown of the breed mix that makes him unique, and over 160 genetic conditions he may be at risk for. Not only will you know what makes your pup look, shed, and play the way he does, but it will also help you provide targeted care by knowing his specific health needs. 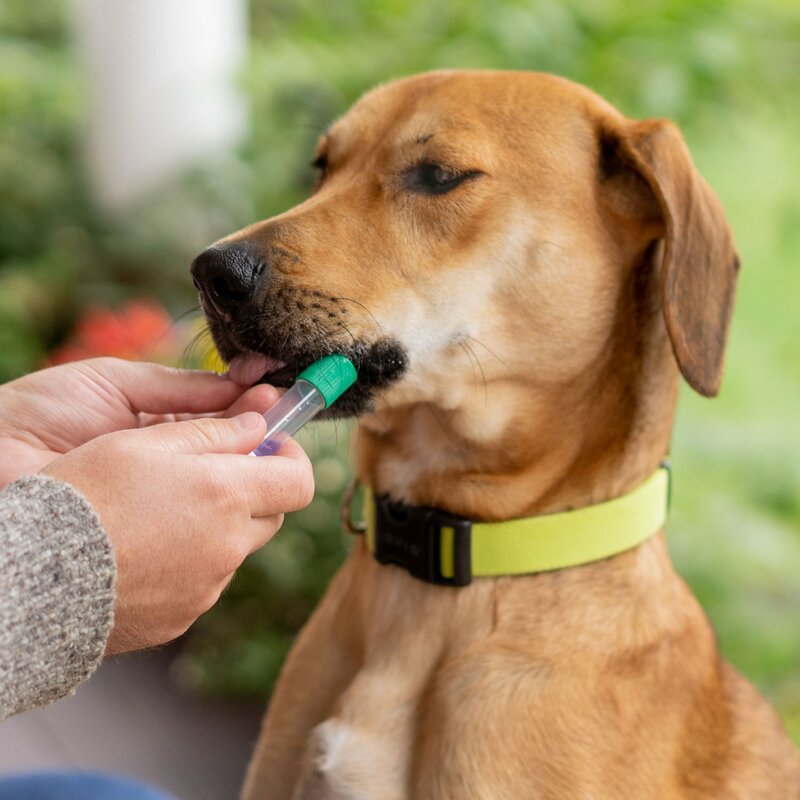 Designed by experts in partnership with Cornell College of Veterinary Medicine, it’s backed by research, proven accurate and examines 100 times more genetic markers than other dog DNA tests. Plus, it even generates a Vet Report you can take to the vet to help you stay ahead of any health risks and provide better care to keep your pooch happy and healthy. Accurately screens for over 165 genetic conditions; and provides genetic ancestry back to great-grandparents. With a simple cheek swab, Embark uses the most accurate breed identification scientifically possible. The Embark Dog DNA Test Kit tests for over 200 dog breeds, even wolf, coyote, and village dog ancestry. Together these breeds cover over 98% of canines in America. Examines over 200,000 genetic markers to provide an accurate breed mix, genetic disease risk, and heritable traits so you can provide personalized care. 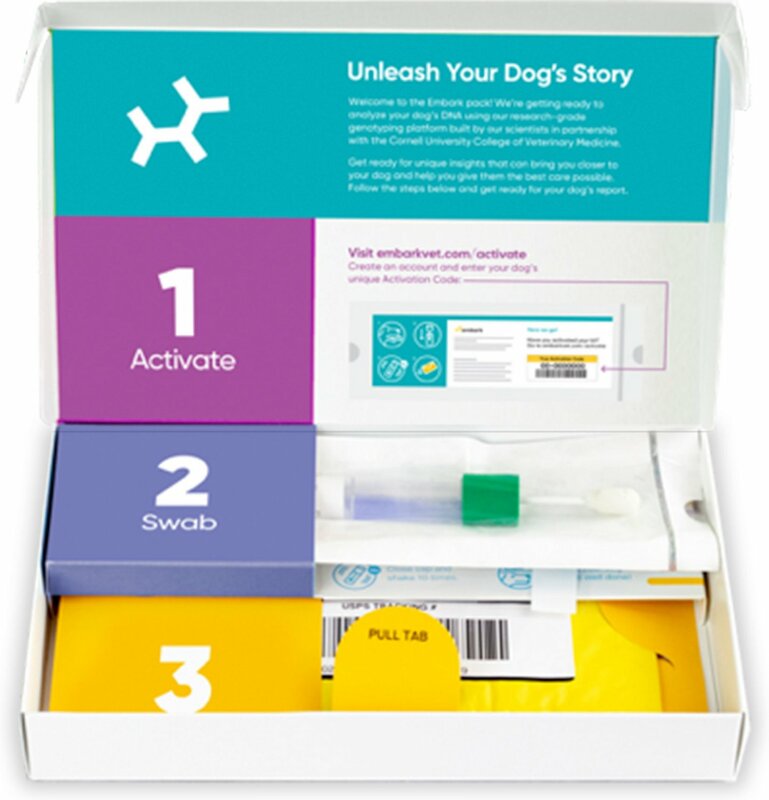 Easy to use by just activating online, swabbing your pooch’s mouth, and simply mailing back in the same box it came in, with pre-paid postage included. Built in partnership with Cornell College of Veterinary Medicine and trusted by professional dog breeders & veterinary hospitals; accepted by Orthopedic Foundation for Animals. Embark results will tell you information on traits that range from coat color to altitude adaptation. 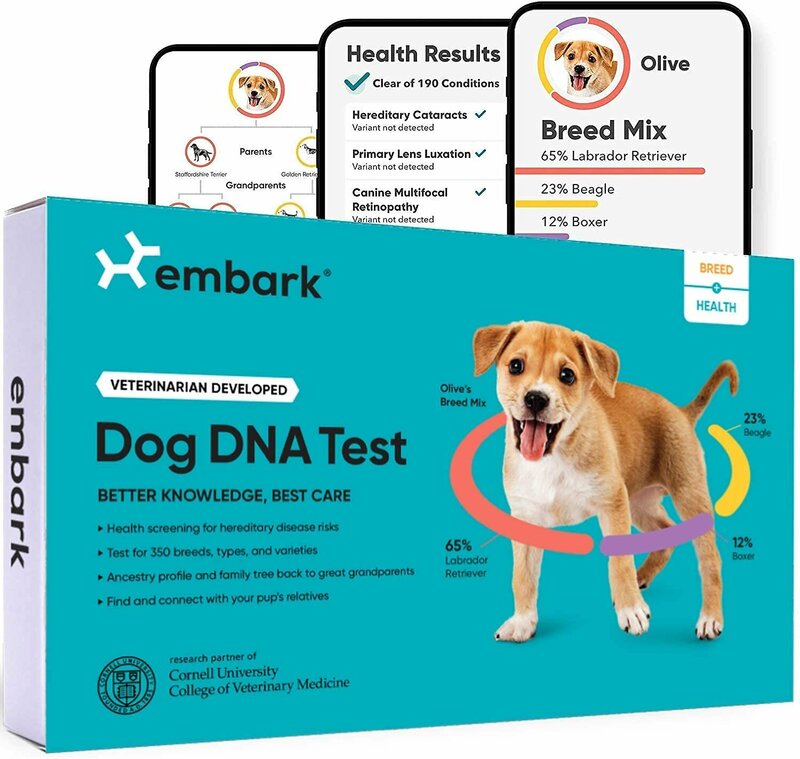 Where other tests just tell you the breeds in your dog, Embark looks at the genetic basis of appearance to explain why your dog looks the way it does. Activate: Visit Embarkvet.com/activate. Updates will be sent to your email address. Swab: No eating for 30 minutes before sample collection. Swab the lower cheek pouches to fully soak the sponge. Bag: Drop your sample back into the bio-bag. Pull yellow strip and stick to sealing zone. Seal: With swab inside, use sticker strip at top of box to seal tightly. Mail your kit. The box is also your return mailer, with pre-paid postage on the back. Leave in any mailbox. I was worried that it would take like 3-6 weeks to get the results back because that is what I had heard everywhere else, but I got my dog’s health results back in 9 days and breed results back the following day. It was so fun and surprising to find out the breeds that make up my dog. I also love how it provides a predicted adult weight (which they claim is accurate about 80% of the time). I really like contributing to scientific research by using this specific test and the quick and thorough service was remarkable. I will use this test for all of my future dogs and I recommend it to anyone else who wants to know their dogs’ breed makeup and health results, too. I haven’t even been able to activate my dog’s kit. I haven’t even been able to activate my dog’s kit online... Every time I enter the code the page just reloads and asks me to enter the code again. I don’t know what the problem is but it’s definitely coming from their end because I have tried to activate it from two different phones and two different computers. I have contacted the company and they are taking a long time to get back to me. I bought this to test if my dog has a serious neurological disease, so I am really really anxious to get the results back. I shouldn’t have to deal with this, especially after paying as much as I did. Embark is a great product. They have been emailing me every step of the way. The emailed me when they got the swab, when they started processing and now I got the health check back just waiting for the breed check to see what breeds my pooch is. I sent this off a couple weeks ago and the company has kept in touch since the minute it arrived at the post office. They update me frequently and I am excited to see what the results are! The item came quickly from Chewy at a good price. I received the box in 2 days time. Mailed it out for testing on 2-12-19. No results yet, but expecting them in next week or two. Hope they are as efficient as you all are. I'm really rating Chewy, since I have not gotten results back yet. I just got my dog DNA results back, and at first I was confused, so I emailed Embark, and just got off the phone with one of their reps who helped walk me through the entire report. It was really helpful. Now I understand the report much better and can see that it's very comprehensive. Some of the test results like maternal and paternal Haplotypes are just interesting, and there are some other results particularly the health ones that are truly meaningful. It's a big relief to know that my dog is clear of all the 167 diseases they tested for. Love the results for the 170 or so genetic defect marker or gene testing. Interesting on the size, appearance, health and temperament testing. Absolutely worthless for testing breed - we submitted two verified unrelated purebred registered dogs, well documented history and phenotype, and got that one was a two breed mix and the other a supermutt - and the results are public so be sure to immediately change your privacy settings. They print the "alleged" breed all over the genetic test results so if you show it to anyone they think your dog is a mixed breed. They dont think that is a problem. This is by far the best tool for a dog owner who wants to understand their canine companion - more. The health results and breed results etc are thorough. We were surprised by our dog's results. Very interesting. Highly recommend. This was so informative and great, it does take a bit longer to get back but so worth the wait. The health screening that it give you is huge, even if you know the breed of your dog, the health screening is invaluable. I have a rescue and was told his mom was full chow and they had know idea on the father, everyone guessed Golden. He came back as 43.2% chow and 10% lab, 10% Akita and 10% GSD, there is Rotweiller, Brittany and Cocker Spaniel to make up the difference! Never would of guessed! I purchased 6 kits for my 6 dogs. I do not yet have all the results but I am very impressed by the frequent follow-up and detailed communication about the testing procedure and potential results. I previously used another test company, which was good, but it didn’t provide the significant information provided by Cornell. Having also been a client many years ago at their vet campus in NY (I used to drive 200 miles to bring my dogs there) I can confirm the same level of excellence and service I experienced in person is evident with Embark via email. I highly recommend this test and I look forward to receiving all my dogs’ results.